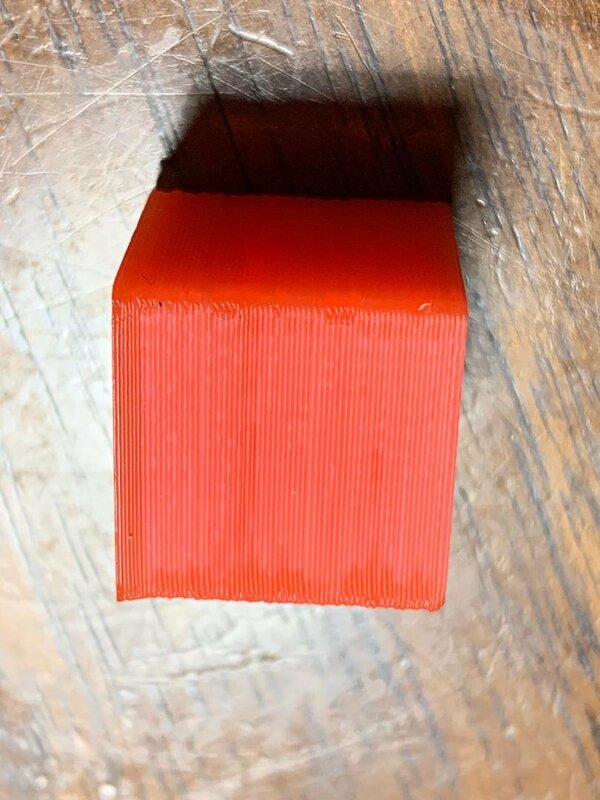 I had (somewhat) successfully printed a test cube with flexible filament but when test printing with pla, each wall line is completely separated from the other walls. It looks like concentric infill vs a 3 line solid wall. I did mess with cura settings in between the flex test cube and pla test cube. 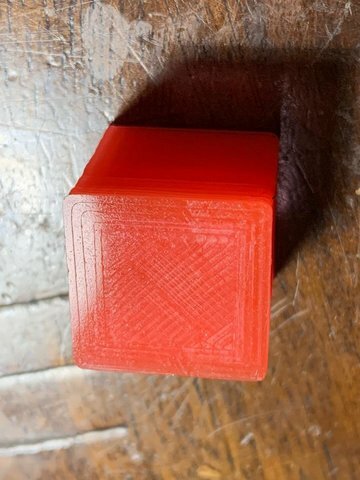 I am using a tevo black widow with cura and the cube was downloaded from thingiverse. I have attached pics of the cube (bottom broke off) as well as pics of my cura settings. Newbie question but appreciate any help! The problem is you have severe underextrusion. Maybe about 50%. Your print speed looks to be 30mm/sec with 0.3 layer height and 0.4 line width that is 30*0.3*0.4 or 3.6 cubic mm/sec. That should be doable. So I'd guess your feeder is somewhat weak. You need about 5 pounds or 3kg force to push hard enough to print at that speed with typical printing temps (220C). So I'd test the feeder and make sure it can pull that hard. One way to test is to energize the feeder but don't advance it and then pull back on the filament hard and see how much force it takes for the filament to slip. Thanks for the reply!!!! I did loosen my feeder tightening screws and will try tightening them more and reprint. Will follow up after re-printing! You are the best! When I switched filaments I didn't tighten the feeder screws as much thinking I don't want to over-tighten. The prints came out so much better now, but any other flaws in the print and/or advice you have is all greatly appreciated! Thanks again so much. 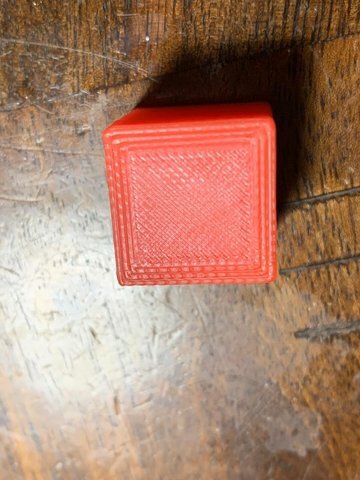 I spent nearly a week changing cura settings.... I should have asked sooner. Thank you again. To me this seems reasonably okay, it looks like what you could expect at 0.3mm layer height. Although there seems to be a bit of "elephant feet" at the first layers (=thick bottom). There may be other reasons, but often this is caused by a bed temperature that is a little bit too high for the material, so the first layers sag a bit. Maybe you could try to lower your bed temperature by 5°C and test if the model still sticks well? Stay with the print, in case the model would come off, so you can abort. When printing on a glass bed (I don't know what bed your printer has), we often have to find a balance between bed temp and good bonding. A too low temperature reduces bonding, and the model may suddenly pop off while printing. A too high temperature also reduces bonding: the model stays too weak, and warping forces tend to peel off the model gradually, in my tests. In both my UM2, and for PLA, the best bed temperature was the default indeed, 60°C. Although 55°C also worked usually. At 45...50°C the models would suddenly pop off. At 65...70°C they would get severe elephant feet and would be peeled off. This will differ from material to material, and printer to printer, so I recommend doing test prints at various bed temps, and definitely stay with the printer!